Voith Hydro has been contracted to install two units at the Ice Harbor dam on the Columbia River in the US, after previously winning a contract to design and manufacture replacement turbines at the same site. The project, operated by the US Army Corps of Engineers' Walla Walla District, will now feature two 106.6MW turbines - both fixed blade and adjustable blade. The design approach taken by Voith and the USACE accounted for all turbine water passages to maximize fish survivability during downstream passage. The work under the new contract, which also includes rewinding the generators, is expected to be complete in 2018. 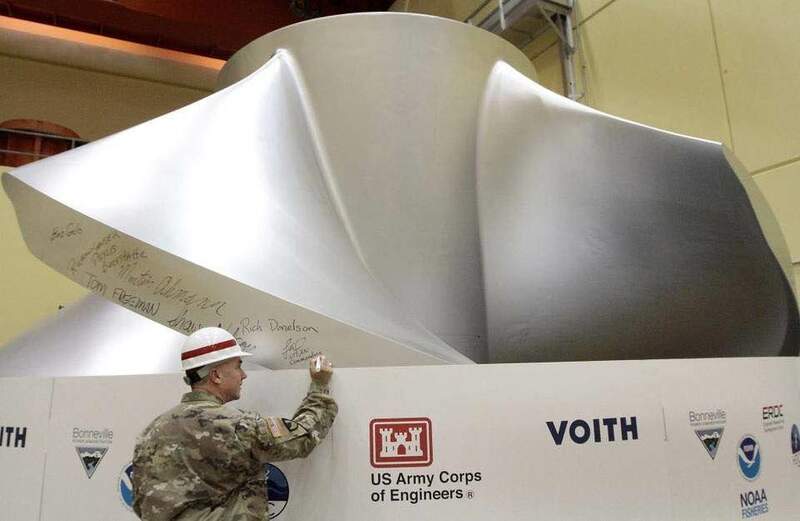 "Voith's work and collaboration with the USACE to design, test, and manufacture the turbines for Ice Harbor will demonstrate new ecological standards for fish passage and turbine performance, and we look forward to a continued collaboration with the USACE during installation," said Bob Gallo, Voith Hydro President and CEO. Voith Hydro has recently completed turbine upgrade work at the Wanapum Dam and is currently involved in the turbine modernization project at Priest Rapids, also on the Columbia River.